Join Florida Tesla Enthusiasts for a lunch meet-up near the Delray Supercharger. You may remember that last year we were pleasantly surprised to discover that Tesla had opened a new 18 - terminal Supercharger Station at The Delray Marketplace without initially having shown it on their "Coming Soon" Find Us map. 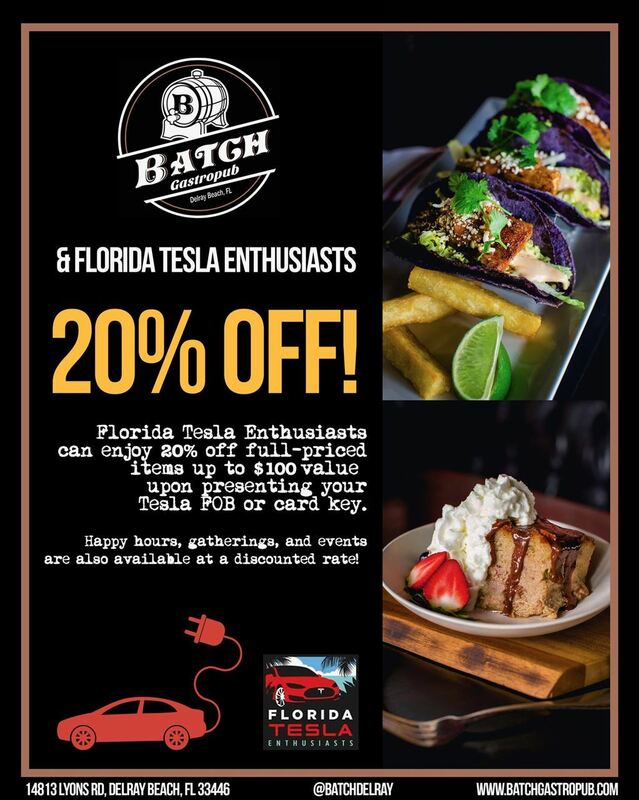 To celebrate the opening of the Supercharger Station the Batch Gastropub has invited us to hang out at their nearby restaurant and is offering a 20% discount off full-priced items by just showing them our Tesla key FOB or Card Key. We will be meeting at the Batch Gastropub at 1:00 pm on Saturday, May 18th. The restaurant is at 14813 Lyons Rd, Delray Beach and is a 2-minute walk from the Delray Superchargers. The location of the Supercharger Station is of course programmed into your Tesla navigation system. 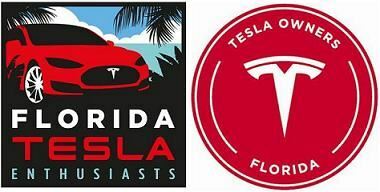 This event is open to the public, but you must register for free at the Florida Tesla Enthusiasts (FTE) website to permit us to obtain a headcount for the restaurant. Responding to a Facebook invitation is not sufficient. The long awaited Gainesville Supercharger Station is finally operational! The station is located at Butler Plaza in the Whole Foods parking lot where Gainesville Cars & Coffee hosts their monthly gathering for automotive enthusiasts of all types. So, after receiving an invite from them, we thought this would be the perfect opportunity to both meet other car enthusiasts while celebrating the opening of the Gainesville Supercharger Station. The Cars & Coffee meet is free to attend. We will be joining them for their June 9th event from 9 AM to 11 AM. Cars will be parked in the lot on the west side of the Whole Foods building next to the covered patio area. Free coffee will be provided to attendees. The Whole Foods Patio pay-by-weight hot bar will be open offering breakfast items for sale. Following the Cars & Coffee event, we will be reserving the patio area for a continuing brunch/lunch Tesla club meet-up. The 10 - Supercharger Terminals are located in the Whole Foods parking lot nearby where the Cars & Coffee meet is held. The location of the Supercharger Station is programmed into your Tesla's navigation system.